There’s no danger of Saints slipping into what Kyle Amor describes as 'the comfort zone' this season if the burly prop has his way. Reaching the semi-final stages of the Ladbrokes Challenge Cup and the play-offs would be considered a successful 2015 season at many clubs - but not St Helens. 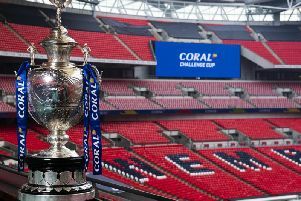 First target will be the Challenge Cup which Saints last won in 2008 after dominating the competition following the turn of the Millennium. “I don't think anyone will go and say ' we will win the treble' but clubs like ours expect to be in the running and on a personal level it would be amazing for me if I was a member of a Wembley winning side,” said the former Leeds man. Amor, a 28-year-old Ireland international, certainly faces stiff competition up front from the likes of Lami Tasi and Alex Walmsley and rising starlets Andre Savelio and Luke Thompson. He also revealed that one of the big talking points in the dressing room after the Huddersfield victory was about the fact that around the hour mark Saints had four prop forwards on the field at the same time.